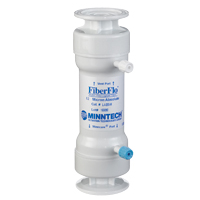 The unique membrane structure of FiberFlo HF capsule filters provides consistent and verifiable pyrogen removal which is superior to traditional, absolute rated membrane filters. High level endotoxin, bacteria, and spore removal make these point of use filters ideal for a variety of water and process purification applications. This most advanced of filtration technologies also provides high flows with high filter efficiency for savings in system design.